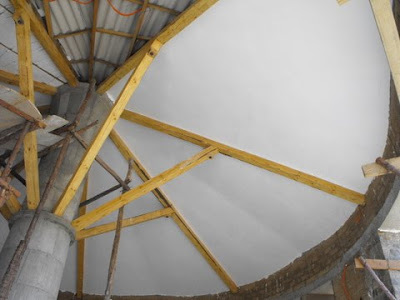 The ceiling area in the round living room consists of eight wedges between the wooden beams. 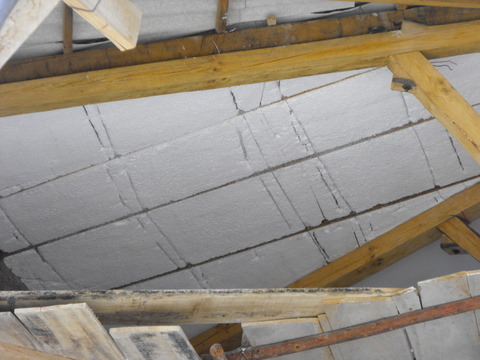 Each wedge is filled with 15 cm thick foam insulation which has to be cut to size and wired into place. The insulation and plastering of each wedge has to be undertaken on the wooden scaffolding tower, which has to be moved around the living room. In the photo above the three layers of roofing can be seen - in the middle wedge is the concrete roofing panel, to the left is the foam insulation and on the right is the completed plasterwork. The finished roof with electrical wiring for installation of lighting at a later date. Work on the living room is suspended for the time being as we focus on completing the rest of the house to give us a space in which to live. Our 'bible' for constructing our house is 'Building with Cob' by Adam Weismann and Katy Bryce. It is full of detailed information on earth building, the only challenge for us being how to translate British weather conditions into high altitude desert climate. When it came to limewashing the adobe walls, the advice from Adam and Katy was to dampen the walls before painting and keep them damp after painting for 48 hours. 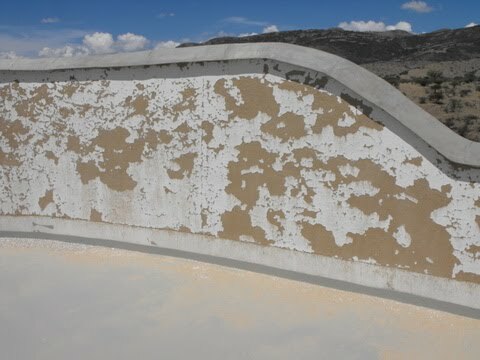 Easy to do in the damp British climate but in the high desert of Bolivia the sun is fierce - the limewash dries as soon as it touches the walls. The result of our first test was disheartening. 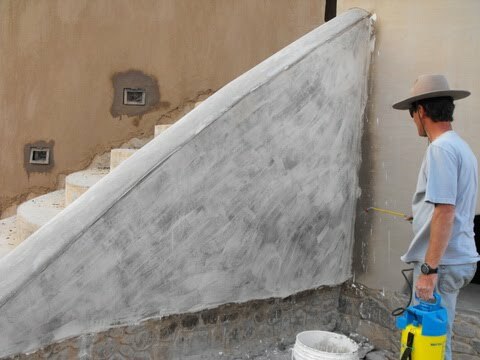 We needed to add something to the limewash to help it stick, and our neighbour Victor gave us a suggestion used by his father when limewashing adobe walls. We had to find some prickly pear cactus. Victor and Ed then cut it up and bashed it with a small axe to aid the release of the juice. 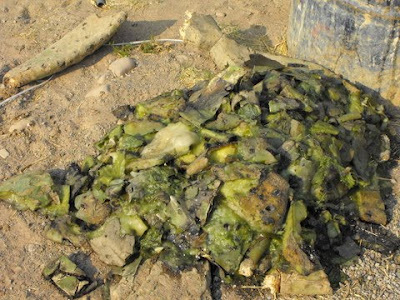 It was then placed in a large barrel of water and left for a week. 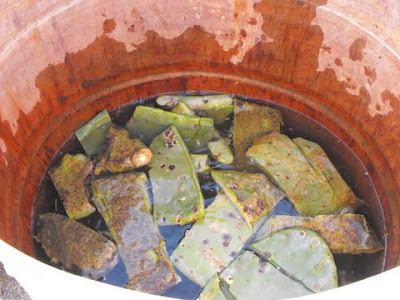 The cactus was then removed from the barrel leaving a glutenous liquid that, when added to the lime putty instead of water, gave a latex quality to the mix. It enabled the limewash to stick to the walls. We were very pleased with the trial using the new mix, and very happy to have Victor's local knowledge. Imagine - Kevin McCloud, presenter of the British Channel 4 series GRAND DESIGNS, stands in front of the Roundhouse at Sky Hacienda. He looks grave. "When June and Ed took on the task of building a contemporary stone and adobe house in Bolivia in August of last year, I had my doubts. 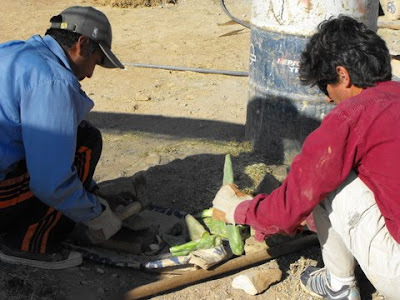 They had no previous experience of building a house, let alone one made of earth; no budget; no firm idea of its design, so no architects drawings; no knowledge of managing workers - nor, indeed of their primary language of Quechua. They had to bring electricity to their 10.5 acre piece of land, which took several months of beaurocratic wrangling; organise the hand-digging of a well to provide water to the property; and endure endless weeks of their 20 year old minibus being worked on by mechanics after the engine blew up. For 8 months of the year they worked in dry desert conditions under the blazing high altitude sun. For the other 4 months they battled to keep the heavy rains from battering the life out of their earth building. Today was the day when they had planned to move into part of the Roundhouse whilst they finished the enormous living area in the next couple of months. But a combination of over-optimism and three heavy rainstorms that required redirecting work to prevent water damage have meant that this will not happen. The earth floors are yet to be finished, and this could take another month. 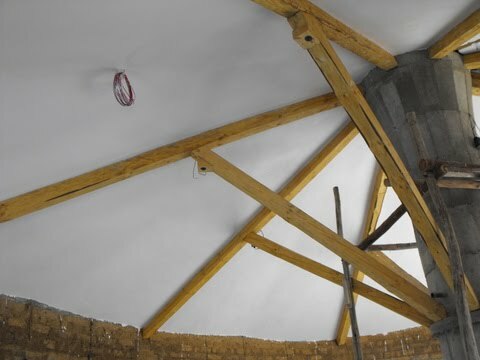 Although June and Ed had previously limited themselves to designing and project managing the build, they are now working 7 days a week to help the finishing work along. 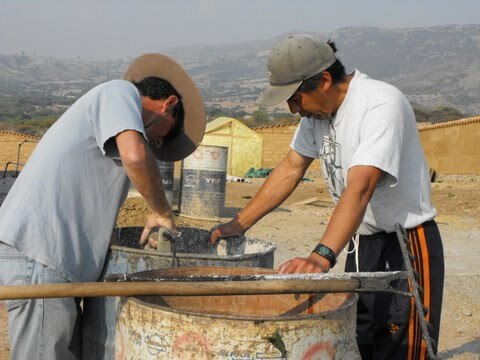 June is limewashing the interior walls, and Ed is fabricating the 2 metal gates to secure the grounds of the Roundhouse. They get up at dawn, drive from Sucre to Sky Hacienda and return to their apartment in the dark. Their life is totally consumed by their desire to move into their dream home. The thing that amazes me is their continued enthusiasm with their project in spite of all the setbacks. They say there isn't a day goes by when they don't love being on the land, watching and helping their creation unfold. This project has gone beyond June and Ed's original idea to inspire people to design beautiful buildings out of local natural resources. 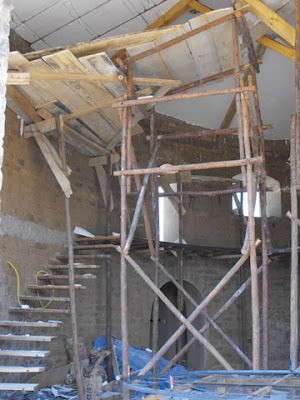 What has emerged quite unexpectedly is the strong connection between them and their team of local builders . The attitude of their workers is incredible - every one of them strives to produce the highest quality craftsmanship in what has ceased to be just a job and is, instead, a creation in which they are so proud to be playing a part."